← Have any Car-Free Vacation Ideas? Tim and I are engaging in a friendly “big load” competition. We both know Tim is bigger and stronger and can carry more but it’s still fun for me to pretend I’m in the running. (Ah it’s the little things that keep marriage interesting). The loads are really hard to gauge since we don’t have a scale that will register that much weight. So our method for determining who is the burliest Xtracycle grocery shopper is how much we spent at Trader Joe’s. I hauled $205.68 back in January. Tim’s latest load was $209. I’m pretty sure he bought more wine and cheese and other expensive stuff than me so I know I’m winning. ; – ) Maybe we need to bring in a neutral third party to be the judge? Happy Friday! It’s a beautiful day in Seattle – I hope it’s nice where you are. This entry was posted in alternative transportation, bikes, shopping, xtracycle and tagged alternative transportation, BIG Loads, grocery shopping, xtracycle. Bookmark the permalink. I’m in Seattle too, and it IS gorgeous. Best morning since I’ve been back here. Thanks for this post. I’m trying to talk my wife into us buying an Xtracycle so that we can go totally car-free on our grocery shopping. and shoo-ey it IS the most gorgeous day in Seattle I can remember – cruising along Alaskan Way this morning the sky was blue, Puget Sound was a remarkable cobalt, and the ferries and sailboats were reflecting a bright magical white – and ALL the mountains were out… bet that’s going to completely HOSE the commute for people in their cars today! “Sunshine slowdown,” anyone?? and ah, Sunshine Slowdown…can’t wait to be on my bike again. The bike on bike and rack action. 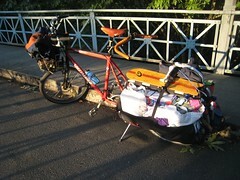 totally thrilled by the new cyclists, with out an Xtracycle that I have seen , biking to the grocers in West Seattle. Viva la Revolution!